Add your GPS location to your Contacts cards. Open your favorite navigation app* directly from the address book. • adds your GPS location to your Contacts cards. • opens your favorite navigation app* directly from the device address book. * Apple Maps, Google Maps, Mappy GPS, MAPS.ME, MotionX-GPS, Navigon, Navmii, Sygic, TomTom, Waze. All iPhone, iPod and iPad with iOS 9.0 minimum are compatible. IPod and iPad Wifi (without GSM option) do not have a GPS chip. The accuracy of your location will be affected. In addition, the display is not optimized for iPad. How to open ABGPS from an HTML link or other iOS app? 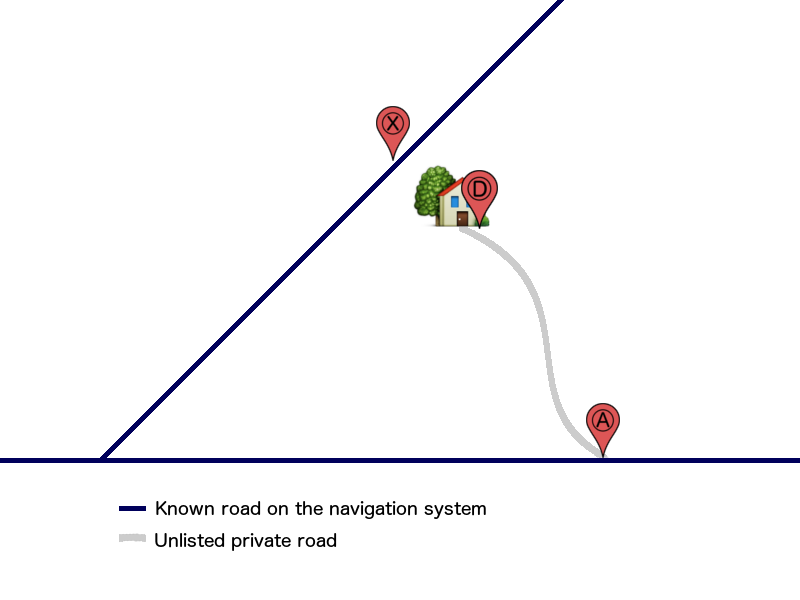 How to use geolocation for efficient navigation? Be aware that the navigation systems that guide validly on listed roads only. Besides the ways directory may be incomplete, it contains no private roads, not even their point of attachment to the known road network. 2- Real destination point Ⓓ. The points are recorded in the same contact card (differentiate labels: Access for Ⓐ and Destination Ⓓ for example). Without this precaution the navigation system can guide you to a remote place and without a real access solution Ⓧ.